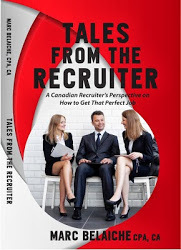 Book by Marc Belaiche, CPA, CA, President of TorontoJobs.ca. This book contains information on job search tips, what recruiters do, interviewing tips and how to find that perfect job. This book is for you if are a job seeker, a new graduate looking for your first job, someone who plans on moving to Canada, a recruiter, or someone who coaches people looking for a job. Click HERE for single copies. Click HERE for multiple copies. CLICK http://tinyurl.com/k4gracf to order through Amazon. Click http://ow.ly/osgBM to order through Kobo (can read the book on your Kobo, Ipad, computer, etc.). Click http://tinyurl.com/m76g8bg to order through Chapters.